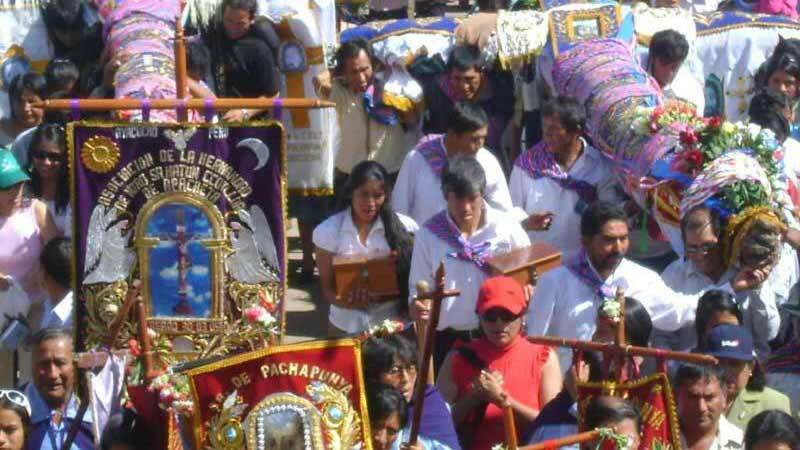 The Festival of the Crosses, also known as Cruces de Mayo (May Crosses Festival), was introduced to Peru by the Spaniards and is celebrated in Peru mostly in towns in the Andean highlands on May 3. Today the Festival of the Crosses is a good example of how Christian beliefs brought to the country by the Spanish conquerors and ancient local customs, traditions and feasts merged to one celebration. Members of mostly rural communities prepare large wooden crosses and decorate them lavishly with flowers and traditional fabrics. In huge processions the worshippers then carry the crosses to neighboring churches. The festivities are often accompanied by folk music and traditional dances including the famous danzantes de tijeras (scissors dancers).